So it might seem like a no-brainer, but making a nice bed is essential to having a good-looking bedroom. We often get stuck in the same routine with the way we make our bed. Here are some fun ways you can dress up your own space with simple changes. Easy breezy white pin-tuck West Elm Duvet and Euro's with a patterned throw at the bottom. White bedding and quilt with graphic shams. Very understated light grey quilt and shams, throw near feet and 12 x 21 patterned accent pillow. Stacking standards behind Euro's creates a nice backdrop for accent pillows. 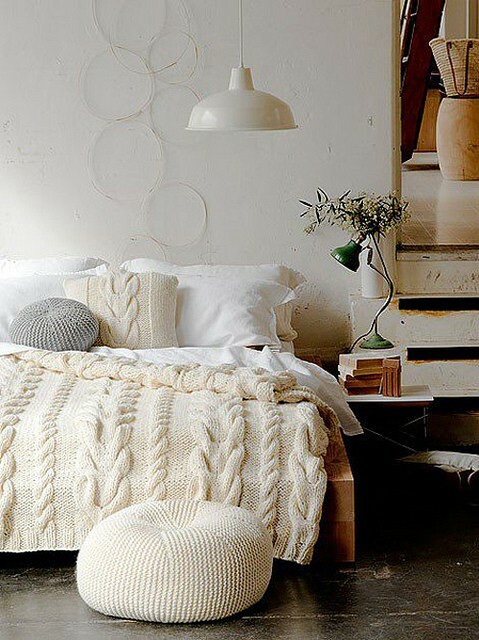 A million textures of white and tons of throw pillows. I just want to dive in. My personal favorite these days.... knit throw and pillows. Very relaxed and understated. For the rich and famous...luxe silk pillows and duvet. 3 Euro's, 2 standards and 2 accent... and let's not forget the mohair throw. What is a good colour white to paint a bedroom? These are all so cozy, and on this cold and rainy NC day, I'd love to be curled up in any...the knit is wonderful!! Designchic: Agreed... Loved your post on Capes yesterday! The Elegant Abode is a full service interior design firm specializing in residential design. We are located in Scarsdale, NY and Westport, CT.
You can view our portfolio at http://theelegantabode.com. The images shown on Elegant Abode were sourced and formatted specifically for this site. We try to always reference back to the original source below the images or at the end of the post by providing a link back to the sites where we found them. However, from time to time we may have forgotten where we found an image. If you recognize an image and know where it came from or it seems that we have made a mistake, please let us know so that we may provide the correct information. If you choose to use any of the images you've found on this site, please link back to 'Elegant Abode'.